[Ottawa – May 30, 2018] With just eight days until Election Day, the NDP finds itself locked into a statistical tie with the Progressive Conservatives. While the NDP enjoys a half-point lead over the PCs, the underlying regional patterns suggest that the PCs hold a significant advantage in terms of seat efficiency. Indeed, if these numbers hold, we will almost certainly be looking at some form of PC government on June 7th. The Liberals, meanwhile, have been stuck below 20 points for some time now. 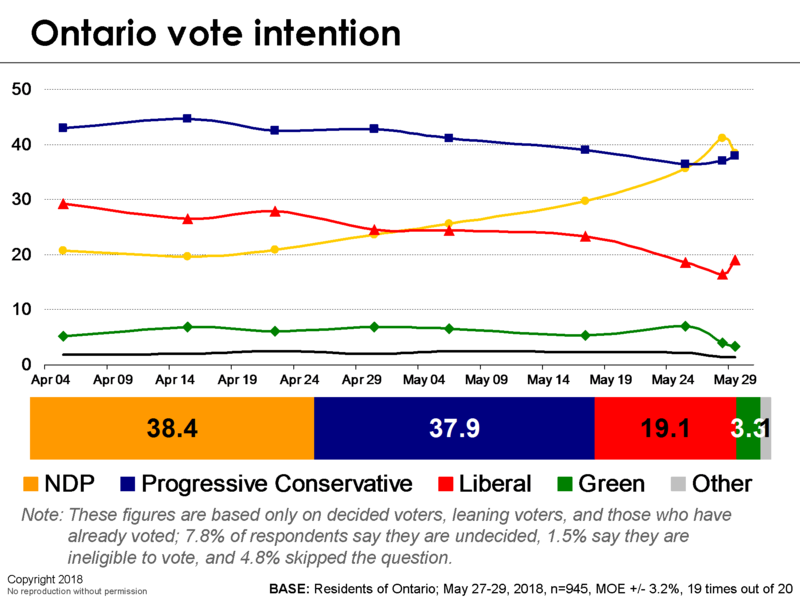 While the surge in overall NDP support seems to have stalled, the party has made a critical gain in the past week: increasingly, their support is shifting towards older Ontarians. 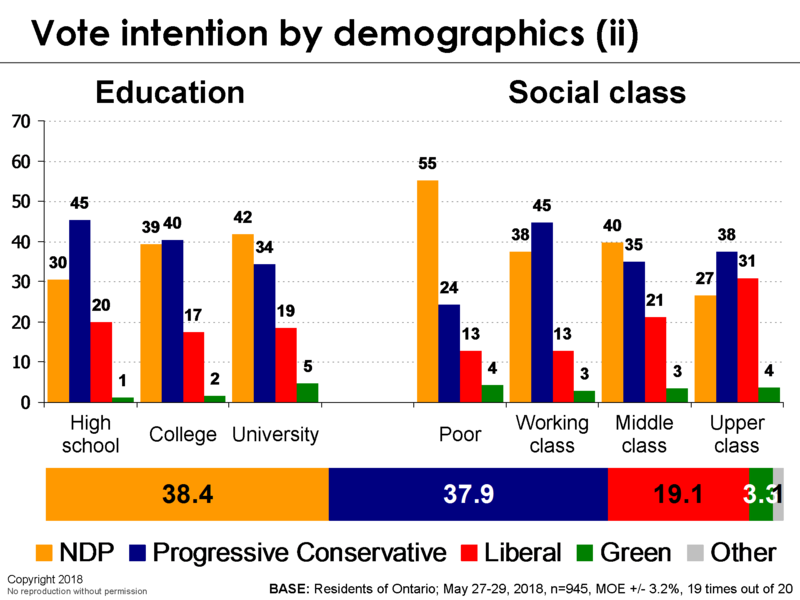 Less than a week ago, the party found its support disproportionately concentrated among those under 35 (a group that routinely fails to turn out to the polls on Election Day), while the PCs led comfortably with everyone over 50. 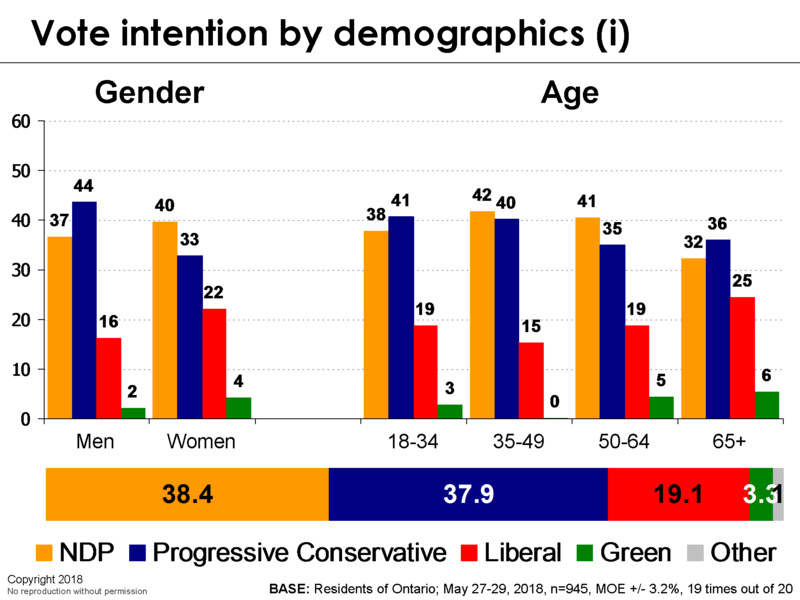 Today, however, the NDP now leads with those ages 50-64 while PC losses have been offset with gains among the much less reliable millennial cohort. While these demographic shifts have not impacted the overall horserace numbers, they have certainly helped level the playing field in terms of turnout. As it stands, the PCs would win the election if it were being held today. However, the election is not being held today; there is still a week to go – a veritable eternity by election campaign standards – and a couple of points from one party to the other would radically change the outcome. The figures in this report are based on a three-day rolling sample. Each day, a new day’s worth of interviewing is added and the oldest day is dropped. The field dates for this survey are May 27-29, 2018. In total, a random sub-sample of 945 residents of Ontario aged 18 and over responded to the survey. The margin of error associated with the total sample is +/- 3.2 percentage points, 19 times out of 20.